This Monday, 30 December at 7 pm we’d like to invite you to a launch party of publication “Like There’s No Tomorrow”. “Like There’s No Tomorrow” is a new book on young Lithuanian photography. Works from 12 emerging artists are presented in an innovative form that invites a dialogue between different photographers’ works, acquainting the viewer with the new tradition in photography and its contemporary post-Internet expression. The works in the publication reveal the shifting aesthetic of young generation photographers, new overtones and the medium’s relationship with objects, all of which are put into a context by four essays by international critics of photography. “Like There’s No Tomorrow” presents photography that so far has been rarely seen in Lithuania and aims to facilitate artistic and critical dialogue around the new ideas this photography carries. Photographers: Jūratė Gačionytė, Paul Herbst, Jonas Lozoraitis, Agota Lukytė, Ekvilina Milaševičiūtė, Ulijona Odišarija, Paul Paper, Nerijus Rimkus, Rasa Staniūnaitė, Ugnė Straigytė, Vulovak, Kimm Whiskie. Paulius Petraitis is a photographer and an independent curator, whose project ‘Sraunus’ – an evolving show of projected contemporary photography – has been exhibited in 8 cities worldwide. His photographic work, made under artistic name Paul Paper, was recently published by Lodret Vandret and Booklet Press. Petraitis is a PhD candidate at Middlesex University in London. 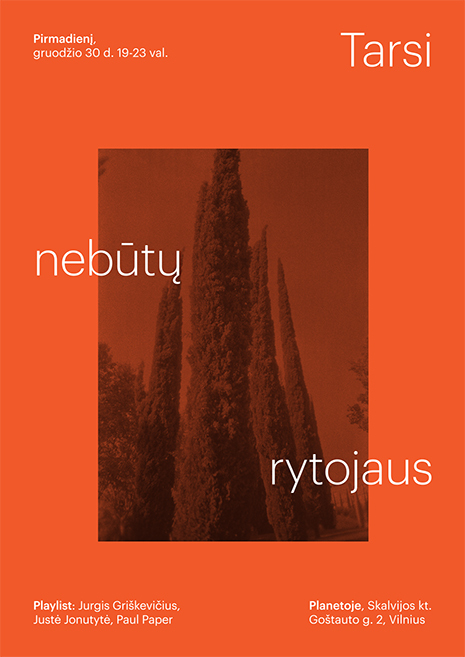 Justė Jonutytė is Chief Curator at Rupert, a centre for Art & Education in Vilnius, Lithuania. She initially started off as a photographer, but soon found interest in curatorial work. Jonutytė also writes on contemporary art and interviews artists.